The new Swarovski EL 10x50 W B Swarovision binoculars with FieldPro package combine maximum functionality, innovation and design. Swarovski EL 10x50 binoculars have a large field of view and a 5-mm exit pupil, enabling you to see bright images that are sharp in every detail, even in difficult light conditions. The unique wrap-around grip enables comfortable operation even with one hand. Low weight and excellent balance make light work of observation over long periods. The sophisticated top-class optical system delivers high-contrast, lifelike image quality. 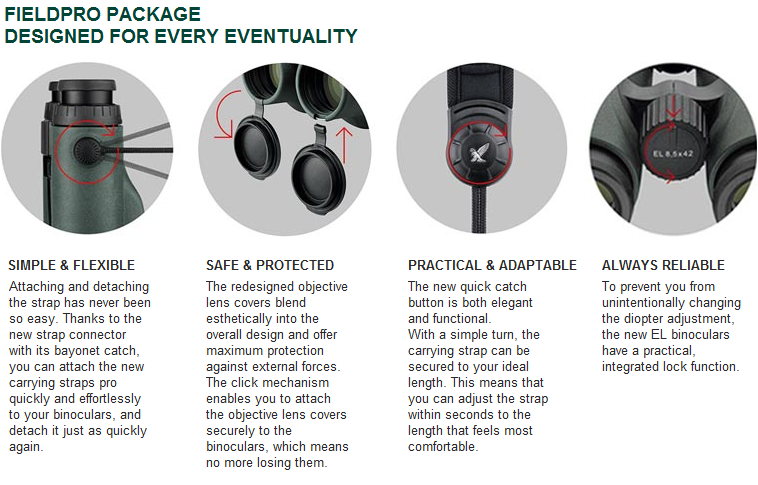 The new SWAROVSKI OPTIK FieldPro package takes comfort and functionality to a new level. Their perfect optical performance and precision, outstanding ergonomics, and revamped design add the finishing touches to this long-range optical masterpiece. 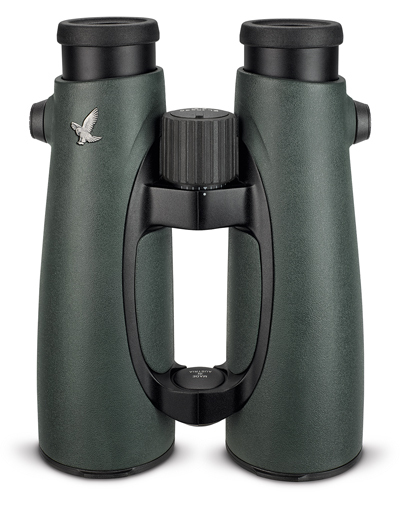 The Swarovski EL 50 SWAROVISION binoculars are synonymous with crystal-clear image quality. This is guaranteed by the superior SWAROVISION technology developed by SWAROVSKI OPTIK. For instance, field flattener lenses produce a virtually flat image, thereby providing perfect edge-to-edge image sharpness. The HD optics reduce colour fringing, creating maximum colour contrast, while optimised coatings make for true-to-life, brighter images. The Swarovski EL 50 binoculars offer a strong magnification and excellent sharpness of detail – just perfect when observing over long distances or at twilight. The most compact 50-mm binoculars that are second-to-none. They impress with their perfect weight balance and allow you to hold them steadily in your hand. Larger exit pupils also provide brighter images at twilight. In the EL series, Swarovski Optik uses high-quality technologies such as the SWAROBRIGHT coating for maximum colour fidelity across the whole light spectrum or the SWAROTOP and SWARODUR coatings for bright, high-contrast images. With SWAROVISION technology, the Swarovski EL 10x50 SWAROVISION binoculars offer an impressive unrestricted wide-angle field of view of 115m. Thanks to the larger exit pupil distance typical of this range of binoculars, spectacle wearers can also fully enjoy the crystal-clear image quality. The twist-in eyecups can be adapted individually to the person's requirements in 4 stages. The Swarovski EL 50 SWAROVISION binoculars also stand for the ultimate in ergonomic design and are sure to impress right from the start. They come with the fully functional, legendary EL wrap-around grip, which guarantees users maximum stability during observation, even with just one hand. The large, grooved focusing wheel is particularly reliable and can also be easily operated when wearing gloves. The history of SWAROVSKI OPTIK is shaped by many decisions of outstanding courage. These also include the development of EL SWAROVISION binoculars, which will convince you with their elegant design, ergonomic grasp and extreme functionality, and count among the best in optics.